While logistical and strategic planning for the World Record began three months previously, the start of 2018 brings the beginning of physical training. With 22 weeks to the start line, a measurement of my current physical capacity was required in order to understand the foundations from which we could build. 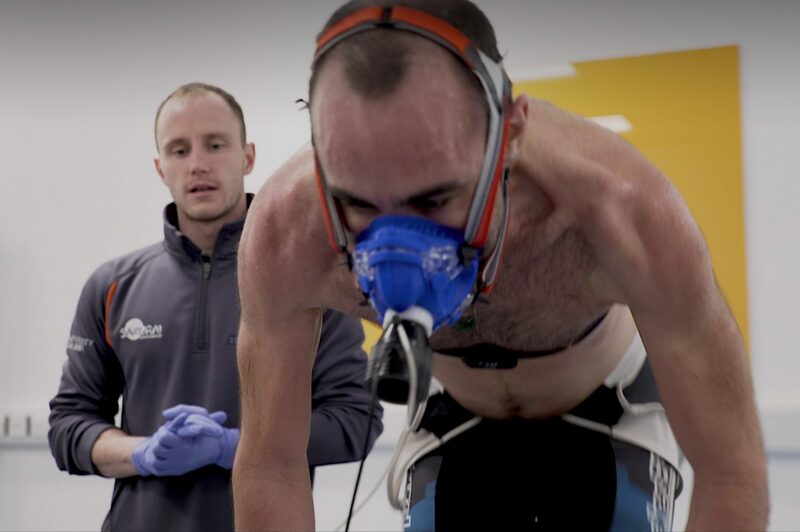 This scientific approach is completely different to cycling around the world, for which a specialised team of experts have been brought on board. Bringing together the latest knowledge, informed by research in human performance, will provide the level of support required for success in attaining peak performance and breaking the Guinness World Record. 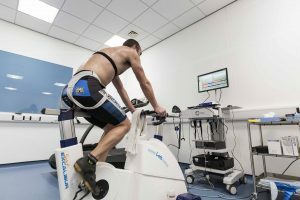 Through a partnership with the University of Derby, academics and sport scientists will utilise the equipment, facilities and infrastructure within the Human Performance Unit, the University’s commercial sport science venture, to bring a comprehensive, scientific approach. Dr. Mark Faghy, Physiologist and Performance Manager on the Fastest Cycle Across Europe team, explains the science behind training for such an epic endurance event. PRELIMINARY TESTING – The extent to which training adaptations occur is determined by the overload stimulus presented during single (acute) and repeated (chronic) training sessions. Setting training intensities that are too low results in limited adaptation and, alternatively, training intensities that are too high over sustained periods of time results in fatigue and elevated risk of injury. From a physical perspective, the optimal training stimulus’ to improve performance can be obtained by training at the appropriate levels which can be determined by testing and pinpointing the appropriate intensities via a physical screening (physiological analysis). The information is then used to prescribe training volumes and intensities that promote positive physical adaptation. The testing schedule is revisited throughout the training cycle to ensure that changes in physical performance are accounted for and the resulting training intensities are adjusted. Prior to testing and to ensure a high level of control, a series of control measures will be implemented to ensure validity of process during data collection. These will consist of avoiding strenuous exercise in the 36 hours prior to testing, abstaining from coffee and other caffeinated stimulants 24 hours prior to testing and avoiding consumption of food in the two hours prior to testing. Body Composition – Following the collection of standard anthropometric measures (height, weight) and limb length, bio-electrical impedance analysis will be conducted to determine the composition of the body. This method will determine both contractile mass and non-contractile mass. To ensure accuracy of this measure and in acknowledgement of the variation of this testing method, hydration status will be confirmed via urine osmolarity. Basal Metabolic Rate – Determined using breath by breath analysis over a collection period of 90-minutes. Values here will be cross referenced with those determined by the incremental exercise test to determine the appropriate feeding strategy during training. Incremental Exercise Test – Conducted on a magnetically braked cycle ergometer. Starting at a low intensity (100 watts) for an extended period (10 minutes), the intensity will increase by 40 watts following each 3-minute intervals. Following each 3-minute period a 60-second interval of active recovery will be included. During this test, breath by breath analysis will be conducted continuously to assess the utilisation of oxygen and production of carbon dioxide which can be used to determine the gas exchange threshold. To coincide, blood lactate concentrations will be assessed at each stage (during the active recovery) and be cross referenced with the expired air data to confirm the anaerobic thresholds (lactate turn point and lactate threshold). EXERCISE PRESCRIPTION – The total prescribed training time is 22 weeks (macro-cycle). During this time a phased approach will be adopted that consists of smaller training blocks (meso-cycles) with each lasting 5-6 weeks, and combine a multitude of training modalities within weeks (micro-cycle) that constitute improvements in physical and psychological performance. 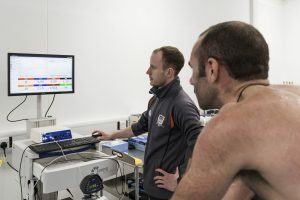 The information collected during the preliminary testing procedures will be used to prescribe exercise intensities during the first training cycle and repeated following each training block to adjust the appropriate training zones. There will be four training zones that will be characterised and referred to during the training period and these are recovery, endurance, tempo and interval. These will be used strategically throughout each training week to promote adaptation of the aerobic and anaerobic capacity. Changes in exercise intensity and volume will be periodised and occur weekly. Data will be collected during all training sessions, logged and used within the fluidity of planning to ensure continued progression throughout each training cycle. Throughout the preparation and the attempt, I will be bringing you weekly behind the scenes videos and blogs, documenting what it takes to prepare for a World Record. Next week I’ll be discussing the details of The Fastest Cycle Across Europe and how my background will take me to the start line.